Florida Oil Spill .com notes that NBC reports a leak at the the bottom of the BOP blow out preventer and pressure at the well is about 6,800 pounds per square inch, lower than scientists expected. Meanwhile 2 miles from the Deepwater Horizon site, oil is reportedly coming out of the sandy bottom of the Gulf of Mexico. Meanwhile, a tropical storm may be headed for the Gulf oil disaster site. Cable news resources including CNN are reporting that there is no oil flowing into the Gulf. 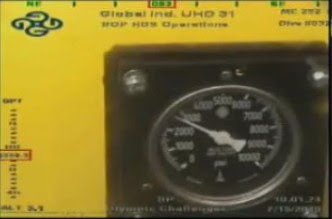 The pressure gauge we have been watching all day appears to be indicating that the well has been capped. BP stock closed up about 7 percent. For the first time in months, great news, indeed. Florida Oil Spill .com has been monitoring operations this morning and notes a visible pressure gauge on the new device placed atop the old Blow Out Preventer BOP. We wondered for weeks how they were monitoring the oil pressures of tens of thousands of pounds per square inch. This morning on the PBS Live Feed, we found what appears to be an oil pressure measuring device. The photo is below. It appears to read between 25,000 and 30,000 pounds per square inch (psi). Image | Fire Underwater at Blow Out Preventer? No. Florida Oil Spill | Around 2:15 am on June 10, 2010 we noticed what looks like fire underwater near the blow out preventer via the underwater feed we have been monitoring. The orange colored substance is visible under the top-center of the screen capture below, behind the text data on the top of the image. The orange pattern seems to move around in the frame. Is it possible that the blowout is now on fire underwater? No, it is chemical dispersant being shot into the oil flow at the bottom of the sea. Out of sight - out of mind. Is this an underwater fire? No, they are chemicals being shot into the oil flow.